Having made one version of the Binky I was eager to try more, especially a mesh version and match with the Darcey Bra. Along came a 20% PDF weekend and whilst I deliberated which patterns I wanted/needed I came across some great lace and fold over elastic. It took such a long time to decide which colour to use. In the end I went with the peach purely down to the fact I didn't think any of my FOE went with the deep coral. Then came the complicated part. I had some blush mesh which was the right colour but I thought too open and then I had peach powernet (both from Tailor Made) that was perfect but too peach so I used the mesh as the main fabric and the powernet as the lining. For the Binky I used as one overlaying the mesh on the powernet. I had made a Willow bra so checked the size I made in this. For the same measurements I was a small in the Willow but a medium for the Darcey as there is a wider size range for this pattern. The lace was also a very open design and for once easy to see on the green mat. I used a temporary spray adhesive to keep the lace in place whilst I sewed along the scallop edge. I find too much movement between the different stretch of the fabrics when I pin or baste. Already looking so pretty. As I used the lace and power net for the band I could enclose all seams. So much neater. Then which foe to use. The elastic for the straps and band also came from a Tailor Made kit. 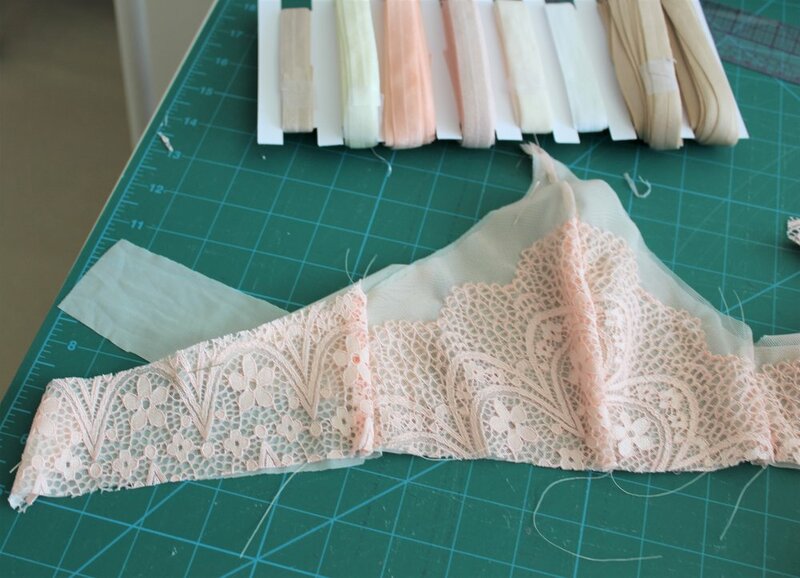 Both the peach and blush looked good but as the the other elastic was more of a peach colour I went with the peach that I bought with the lace. Before you fold down your band elastic you attach the bottom of the strap which again makes it look so neat inside. Decided the rose gold findings looked the best. Then you need to check that the back seams fits into the fastener before you apply the foe to the top edge. Once done you then sew the strap to the foe to keep in place. So on to the Binky. The first pair I made a few weeks ago were a fabulous fit so no worries about what size to make. I did notice that the brief patterns have 1/4" seam allowance and the bras have a 3/8". I always check as this does seem to vary from designer to designer. I was so pleased when the pattern piece fit the scallop edge perfectly. Not often it does that. Then I used temporary adhesive spray to keep my two layers of mesh and powernet together. Just laying out the pieces I knew how pretty they would look. 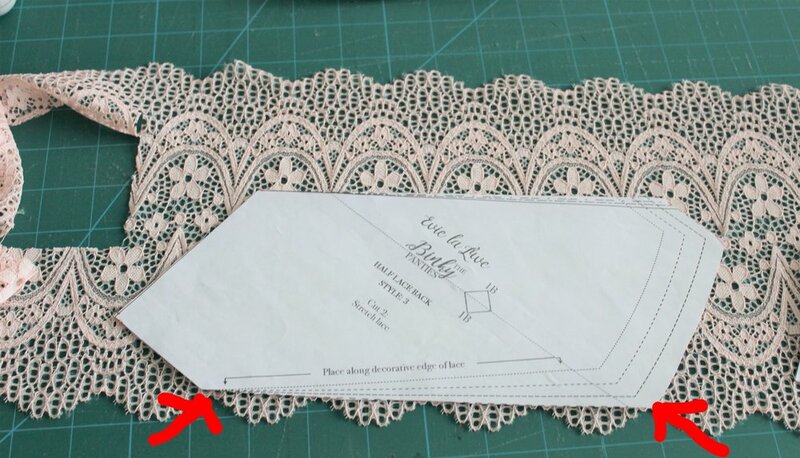 The lace attached and the seams look off centre but it is the fact the seams are overlocked and pressed to one side giving the illusion that they are off. The front seam is enclosed between the gusset and lining. The back seam is overlocked as are the side seams. I did sew a few machine stitches, as suggested in the pattern, where the lace meets the foe especially as the lace is such an open design. Just the waist to do. Well I have to praise myself for such a fabulous job. The fit is perfect. I was concerned how the V of the bra would look but again the look and shape is gorgeous. And, although I am getting to grips with foe and have a good feel for how much to stretch, I found the guides in both patterns to be spot on. All neat and tidy on the inside of the Darcey and a fabulous back view of the Binky.